2017 has come to screeching halt. From recovery of demonetization to rising Oil prices and implementation of GST to Gujarat Elections. We saw the market move everywhere, though the direction was firmly up. There were lot of jittery moments, but it ended on a good note. We bring to you the top performers of 2017 across different segments. While Nifty Returned 28.74%. 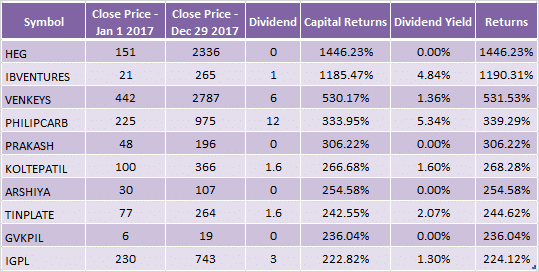 Out of 50 Stocks only 7 stocks gave negative returns and the rest advanced. 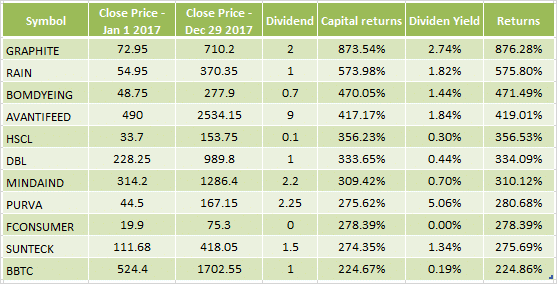 8 Stocks in Nifty 50 gave positive returns but lower than bank FDs 8% ( IDFC used to give 1 year FD at 8% on Jan 1, 2017). It seemed, much like the revival of the old guard. Metals, Oil and Gas and so on. Tata Steel had an impressive 82% return, but it’s still lower than the highs it saw in 2006-07. Reliance at 70% has its best year in a long time. Large Cap performers include stocks which had market cap above Rs 20,000 Cr as on Jan 1, 2017. While their are 110 companies which qualifies under this category. 13 stocks declined the rest advanced. Here again, some of the old guard comes into play. DLF from Real Estate. United Spirits (MCDOWELL-N) and the metal plays of Tata Steel and Sail. The new entrants with Bajaj FinServ, PEL and even Sun TV (thanks to the 2G judgement too) have done excellently. Mid Cap performers include stocks which had market cap between Rs 5,000 Cr to Rs 20,000 Cr as on Jan 1, 2017. Their are 175 stocks under this category., only 22 declined. The Future Group did very well in the year, and the retail arm did a 4x move. Adani transmission too turned around, and the momentum in financial players like IIFL, Edelweiss and Motilal continue. Tata Global, on the back of major debt reduction after Tata Sons bought over it’s stake in Tata Chem, has done excellently indeed. Small Cap performers include stocks which had market cap between Rs 1,000 Cr to Rs 5,000 Cr as on Jan 1, 2017. Their are 374 stocks in this header, only 55 companies declined. Graphite started a small cap but now is much bigger – with a 9x return. RAIN and HSCL too are part of the Carbon pack. Lots of good solid stocks in there, and some of them might continue in 2018! Small Cap performers include stocks which had market cap between Rs 5,00 Cr to Rs 1,000 Cr as on Jan 1, 2017. Their are 196 companies in this category out of which only 32 declined. Lots of interesting stock movers in the last year show us how markets can change the fortunes of many. From the steel players to real estate, we have seen sectors revive. We’ve seen new players, in the power transmission space, in Carbon, in metals and even in mining, take a very good position. 2018 will more throw up more opportunties and more stocks our way. But, as a quick note, be careful. This sounds like an endless money making machine. The word “endless” is the worst thing to assume. It always ends badly for some stocks, but it doesn’t have to end as badly for you. Your money shouldn’t be married to a stock, or a business. Momentum has worked wonders in the last year, but it won’t work the same way each year, and definitely not in the exact same stocks. Happy Investing!